I would like to offer a review of a very worthy option. In taking a very detailed look at the La Crosse Model #88907 Forecast Station, I found a model that you may want to consider as a choice. This colored display is well received by many happy customers and, for the price of it, could be a welcomed addition to your busy life. The device is perfect for the person who likes a couple of weather things supplied to them every day. If you look for the temperature outside, and if you would like some idea of what the weather will be like in the next twelve hours than this station could be for you. At a quick glance, your display will show you the outside temperature, and it will also be supplying you with an icon that is depicting a weather condition. As an example, it may look just cloudy to you outside, but the icon is showing heavy rain. This would be very helpful to you. You would grab a raincoat and an umbrella before you leave the house. You are now prepared for the predicted downpour a very useful tool for you to have. If however, you were in the need for a more detailed forecast for the next few days, this would not be the right tool for you. Let’s say you are planning a golf outing on Saturday, and it’s Tuesday- you would need more sophisticated weather equipment. This model from La Crosse includes indoor & outdoor thermometers and a barometer which is used to roughly forecast the upcoming weather with a series of animated weather icons. The accuracy of the forecast is 70-75%, according to the manufacturer, and this seems to line up with actual experience. It does need 3-4 weeks of learning in order to reach a stable state. During that time it is recording historical information about the barometric pressure in your own yard in order to understand your environment and use that information in its prediction model. Please note the unit does not have a rain gauge, nor an anemometer, nor any other type of weather measuring tool. The 88907 forecast station uses a remote sensor to measure (Temperature) and collect (Barometric sensor). This information is transmitted inside to your display unit. The type of transmission is wireless at 433 MHz, and can be done from the remote to the display unit at up to 300 ft. (91 meters). Many people do report a couple of things that affect the transmission. One is the distance of the remote sensor from the main display. The other is to make sure you pick a shaded location where the remote sensor can be located, so that exposure to direct sunlight is minimal, and it is somewhat protected from the rain and snow/moisture elements. While it says the remote is water resistant, why push your luck on it. The Display is featured as a color display. The color is definitely prominent when looking at the display facing. Let’s take a tour of what you will find on display for your viewing. The current time is shown as either a 12 hour am or pm reading or can be selected to show time in a 24-hour format. This is the WWVB Atomic clock. It is set to the atomic clock in Fort Collins, Colorado. Then to the right of that is a calendar display which shows a day of the week and the month/day also is seen. The atomic clock for this works for 7 different Time Zones. Keep in mind that the unit is supported for proper operation in these time zones, and there are no guarantees if you buy to use in other time zones in the world. If you have activated the alarm setting, that will show up as being set in this area as well, by way of a little alarm icon. Lower down the front facing you will see the animated forecast tendency icon display. Below that you have the remote temperature setting and then you see the indoor temperature setting as well. The weather station samples the barometric pressure every 12 min. These samples are averaged hourly and daily then stored in nonvolatile memory. What nonvolatile memory is, it is computer memory that is stored, so that it may be refreshed (brought to recall) even if there is a power outage. So if your batteries run out of power the information is still there for you. The three-hour pressure icon change is based on the last four average hourly readings. Next, take a look at the explanation for the trend indicators icons and the right side of the indoor & outdoor temperature displays. The trending reports are on the right side of each. The indoor and remote temperature humidity icons will update every 30 minutes. There are three icons for this. At the bottom of the facing plate will be any temperature alerts you have set up for yourself. The alerts are available for both indoor and outdoor (remote Sensor) settings. You are able to set a low-temperature alert and/or a high-temperature alert for both situations. Some examples of where this would come in very handy, you could set up the outdoor low alert for 34 degrees Fahrenheit, so that you would have time to go outside and cover your plants to protect them from freezing. Another example would be for indoor, you could set the indoor low-temperature alert for maybe 60 degrees if you needed to be alerted overnight to either close your windows or turn your furnace on to stay warm. I know often our home heats up to 75 degrees in the summertime, but we love to sleep with the windows open, but I would like to know if the temperature inside has dipped down to a chilly 60 degrees because I would then close the windows. All of this in mind with saving money on my energy bill, of course. Upon further examination of the display facing, on the lower right-hand side is an interesting indoor humidity comfort setting gauge which shows you how comfortable your house is at the present time. Further study shows the room comfort icons are determined by these factors. In taking a peek at the indoor comfort icon on the display it will show you five different status readings. The display unit also has settings for heat/dew, time set, and snooze/light high/low settings. These are on the right-hand edge of the display unit. The Heat/Dew Buttons are there to alert you to changes. The Heat Index if pressed will give you a reading of how comfortable it is taking into account the temperature and moisture content. Whereas, the Dew Point is simply the temperature at which the present moisture content in the air would condense. This level could affect how comfortable or chilly the air may be to different people. Some like the air dryer, some may like it with more moisture content. This may be important for people with breathing health issues. The last thing is that there are buttons on the lowest right-hand corner on the front for alerts and for the alarm as well. These are any temperature alerts you may have set up. Some customers have suggested that you may want to keep the main display unit plugged into the power outlet. The reason for this is because the display readings are not as bright and visible with just the “AA” batteries furnishing the power to the display. We believe this is a vital point with customers. With the display unit not plugged in with the AC adapter, many people report that the display just does not light up enough for their easy viewing. It appears that under just battery power, people do struggle with the way the display functions for them. With just battery powering the display, often you will have to find the display backlight button on the side, to brighten it for you. Finding the backlight button on the side is very difficult, and then it will only light up properly for 10 seconds. For some, the elderly or the handicapped, it couldn’t be done easily. For others, it could become a point of agitation, enough so you may be wishing you had never purchased the product. Let’s say you have it mounted on the wall, you will not want to have to walk over to it to just get a proper look. So please consider the attractiveness of the colored displayed versus the backlighting situation, in your purchasing decision. relating to manufacturing defects in materials & workmanship. The La Crosse 88907 Forecast Station is powered with 3 “AAA” batteries. It also comes with an 5.0V AC power adapter which can be plugged into your electrical outlets. Most customers use the supplied power AC adapter rather than deal with the start up process that you will have to go through if your battery power runs low and the unit shuts down. The adapter can be used as a 120 Volt electric. As I know it does not work with 110V, 127V, 220v or 230V or 240V or any other outside the USA power supplies. The power cord is about 3 feet long and the brick is about the size of a typical smartphone power brick. The remote is powered with 2 “AA” batteries. It is suggested that these “AA” batteries would be Lithium batteries. The Lithium batteries will work at much lower outside temperatures than normal “AA” batteries, thus preventing remote sensor power outages. Please be aware of this if you live in colder climates. The remote sensors TX141TH-A, TX141TH-Av2, TX141TH-B (433 MHz) are compatible to be used with this Forecast Station. The unit is easily mounted on a wall, or you can set it on a desktop or a shelf somewhere. However, this does create a problem for many owners. One highly mentioned problem is that the display doesn’t show well unless two things come into play. One is you need to hit the display button, which happens to be on the right-hand side. If fastened to the wall, you will not be doing that. The other thing is that the display is dim without the power adapter hooked up to it. This means the display can only be near an outlet. As I earlier reported the power adapter cord is only three feet long. So please realize these possible limitations for you when you are considering to purchase or not. Many owners report the display only lights up well for a couple of seconds before the brightness diminishes. Also if you can look straight on it is easily seen. If you look up at or down at the icons, they are difficult to read. The brightness, hi/low temp, dew point buttons are all on the right-hand side of the display. If the display is mounted they are very difficult to use. If you are elderly or a handicapped person this would not be something you would probably wish to deal with. If you could use the unit, by using the kickstand to set on a desk, and you are able to plugin in the display, then we believe you could find many hours and years of very enjoyable, productive use from this equipment. A well-made decision. There are situations for which this forecast station would be a very adequate, and sound purchase. If you use time, temperature and a mildly accurate weather prediction for planning out your daily life, this weather station from La Crosse would fit well. The cost to you would be very affordable and the upkeep very minimal. If you are a weather geek or you need much more detailed weather information, you would be very remiss to even spend any time looking at this forecast station as a purchase. While it is very lacking in any instruments you would be looking to get your hands on, you simply would find it to be more of a reporting station. So if you are into using detailed weather information for planning out a family trip to a local park, or maybe even taking your convertible out for a drive, this is not for you. Overall we recommend this a solid purchase for the amount of money you are putting into it. It comes highly reviewed by customers and well reviewed by far the large majority of those past purchasers. When considering to purchase or not, examine the units value to you. There are many attractive features offered to you with this unit. If you are able to work around a few of the down points, we believe you will find great value in the La Crosse 88907 Color Forecast Station. La Crosse Technology presents this forecast station 308-1425B. It features historical pressure graph a wireless color weather station that provides precise real-time weather data straight from your backyard. 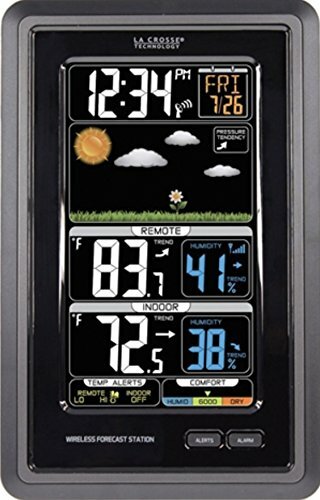 La Crosse 327-1414W Color Weather Station A complete deep researched review for the La Crosse 327-1414W Color Weather Station. It is a highly regarded personal weather station made by La Crosse Scientific Technologies. La Crosse Technology introduces a Wireless Color Weather Station with precise, real-time backyard weather. Animated color forecasts with trends react to changing barometric pressure. Indoor comfort indicators can help you achieve a comfortable and healthy living environment and may even save you heating costs. Monitor in/out temperature trends with high and low alert settings. Measure in/out temperature and humidity with daily min/max records - all on one easy-to-ready color display with adjustable brightness. The La Crosse S88907 Forecast Station has been available for a few years now. It still sells well and after you read my review you will see why. I cover many great pros for buying.